Dear valued customers, We would like to express sincerely thanks to you for subscribing to our FiinPro® Platform. We believe that it provides useful data and enhances the efficiency of your operations. What’s new in this FiinPro? Foreign Room Data: In this version, FiinPro allows users to track the most up-to-date foreign ownership data, including total foreign room, foreign ownership and remaining foreign room of the whole market along with market real-time movement. At StoxPlus, we maintain a detailed ownership analysis that not available on the market. Off-Balance Sheet Data of Banks: Given the large exposure of the off-balance sheet items at many banks in Vietnam which could inherently result into NPL, besides of the usual key indicators of financial statements, Version 1.0.5 also displays off-balance sheet financial indicators of banks enabling a full picture of risk profile of banks. 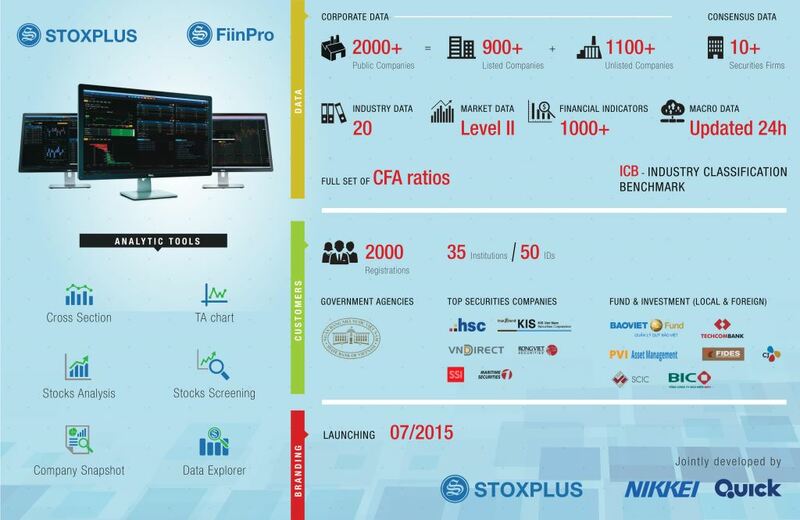 Foreign Buy (real-time) on HOSE: According to the plan of HCM Stock Exchange, this data will be provided in early May 2016, so that FiinPro allows users can keep track real-time data through Live Board and other related functions. Currently, it is only available on HNX. Technical Chartings: We introduced the most common 35 technical indicators for users to analyze price movements based on the accuracy-proven adjusted data and other data inputs for active trading oriented users. Market Performance: A brief of market overview, including market Indices P/E, P/B, Beta, ROE, ROA for both HOSE and HNX stock exchanges in Market Summary. Users can be able to generate an automated market report from FiinPro. Customer Support - Online now! : In order to improve our customer services, our customer support executives now are online via chatting function in FiinPro Platform and ready for any technical or data support queries from users and in one simple click. How to upgrade? Users can upgrade to FiinPro version 1.0.5 from 00h00 May 11, 2016. Step 1: Close and re-open your FiinPro Platform. “Skip” button is to ignore the upgrade if you do not want to. However, we strongly recommend you upgrade FiinPro to use it in most effective way. We will update the whole system on 10/05/2016, start at 8:00 PM to 11:59 PM. Please be informed that, the system should be down for the upgrade, and users cannot use FiinPro Platform during this time. We are sorry for any inconvenience and would like to welcome you come back and upgrade FiinPro after the time slot above.